Ya’alon is a former Chief of Staff of the Israel Defense Forces, but he did not have a distinguished term of service there, was not well-liked and returns without a great deal of good will among the military and intelligence services’ leadership. In fact, colleagues in Israel tell me there is a good deal of consternation in those services regarding Bogey’s appointment. But for now, they will wait and see how he acts. For a deeper look at Ya’alon, see my recent piece on him here. The new braintrust is also somewhat unpredictable. Its key players are inexperienced, especially in international diplomatic and security matters. On that front, if the loss of Barak turns the heat down on Iran a bit, the departures of Likud stalwarts Dan Meridor and Benny Begin turn it up regionally and domestically. Both were relative moderates in Likud, thoughtful strategists and believers in at least the Israeli version of the rule of law. Meridor in particular tended to be a moderating voice that Netanyahu trusted on foreign policy matters, including the Palestinian issue. The closest the new group will have now is Tzipi Livni, the former Foreign Minister. Livni is widely regarded as standing virtually alone in the new government as a dedicated supporter of the two-state solution. This, however, is somewhat belied by her experience as Foreign Minister. Though considered a leading dove even then, Livni rejected an offer from the Palestinian Authority that gave Israel virtually all it had demanded on matters of territory, Jerusalem and refugees. Still, Livni was the only candidate among mainstream parties to have run in the last election on an explicit platform of negotiating with the Palestinians and support for a two-state solution. That this puts her far ahead of the rest of Netanyahu’s cabinet says a great deal about the nature of the new governing coalition. In any case, Livni’s voice is not one which carries a great deal of weight with Netanyahu. He may value her presence as a sort of fig leaf for the US and Europe to allow them to believe that there is some kind of peace process to restart, but the two have never gotten along and there’s little love or respect between them. It may be that Bibi will pay her a bit more mind due to the inexperience of the rest of his cabinet, but even if that is the case, her voice will never carry anything like the weight Meridor’s did. The other two key players in the government, Yair Lapid and Naftali Bennett, are newcomers who have no experience in any of the diplomatic and security issues this group will be dealing with. It is difficult to say how they will act with regard to Iran, Egypt, Syria and Lebanon. In Israeli politics, being a comparative centrist, like Lapid, or a far-right figure like Bennett is not necessarily a good indicator of how they will think about external security matters. The remainder of the group consists of Home Front Security and Communications Minister Gilad Erdan, Public Security Minister Yitzhak Aharonovitz and the empty chair being reserved for Avigdor Lieberman when and if he clears the breach of public trust charges he is currently under indictment for so he can resume his position as Foreign Minister. Aharonovitz, from Lieberman’s Yisrael Beiteinu party, served as Public Security Minister in the last government, so he has some experience, but his voice has never been seen as influential in the cabinet deliberations, or even in the Knesset. Erdan is a younger, ultra-conservative Likud Minister of Communications, known for his vocal opposition to the peace process, support for revoking citizenship for “disloyalty,” and a marked racist attitude toward Arabs. In this, he is, in many ways, a kindred spirit of the man who might temporarily occupy Lieberman’s seat at the table, Ze’ev Elkin, the new Deputy Foreign Minister, appointed by Netanyahu with Lieberman’s full support. Elkin, who has been a driving force in the Knesset behind anti-democratic legislation targeting Israeli NGOs that advocate for peace or defend the human rights of Palestinians, and would explicitlysubordinate Israel’s democratic structures to its Jewish character as a matter of law, is an explicit advocate for annexation of the West Bank. That stance actually puts him to the right of Lieberman. Elkin is also a hawk on Iran, and supports a unilateral Israeli strike. It is unclear whether Elkin will be part of the cabinet meetings, and the fact that Netanyahu has actually divided up many of the duties of the Foreign Minister while the actual office is vacant indicates he will not be. Yet, even if he is, neither he nor Erdan has a powerful voice in these proceedings. Indeed, no one in this cabinet has a voice that is likely to be all that influential on Netanyahu, though the sheer political power that Bennett and Lapid wield will mean that Bibi needs to give their stances serious consideration. What do we conclude from all of this? Much will depend on Moshe Ya’alon. His voice is sure to have the most sway in this cabinet despite Netanyahu not being all that fond of him. Bibi wasn’t crazy about Ehud Barak either. But the bigger question regarding Bogey is whether he will try to change the leadership of the military and intelligence services. Those leaders — Tamir Pardo (Mossad), Benny Gantz (IDF Chief of Staff), Aviv Kochavi (military intelligence, or Aman, who is much more hawkish on Iran than the others), and Yoram Cohen (Shin Bet) — have been a generally moderating force on Bibi’s ambitions. With the inexperience of the rest of the new cabinet, their voices will be even more influential. But Bogey is not necessarily on the same page with these men and could move to replace some or all of them. Either way, there are a few things we can be sure of. The new cabinet will have to live with the fact that the Obama Administration seems to have asserted control over the Iran standoff, at least for this year. The struggle over an attack on Iran will be fought in Washington, not Jerusalem. And it seems this cabinet will be largely content with that as long as the status quo holds. But the new cabinet will be towing an even harder line on the Palestinians. With Obama seeming, from his recent speeches, to have given up on trying to get Israel to change its course, Israel’s abandonment in practice of the Oslo process will be set in stone, and where things go from there will depend on other actors, including Turkey, Europe, the Arab League states and the Palestinians themselves. The real wild card is going to be the neighboring states. How will Israel react as instability in Syria, Lebanon, Egypt and possibly Jordan continues to grow? 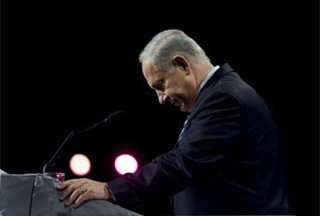 Without seasoned voices in his cabinet that he trusts like Meridor, Barak and Begin, and given that the voices Bibi will have to listen to are Lapid and Bennett, but only because of their political power, Netanyahu — already a leader who is slavishly devoted to guidance by the latest public opinion polls — is likely to become even more of a prime minister who sways on these issues with the political winds.